Tooth loss. During childhood, this event is often met with excitement. It's a rite of passage, a sign that we’re growing up. If you lose a tooth in adulthood, the first thought that may come to mind is "I'm not old enough to lose my teeth!" The truth is, you're never old enough to lose your teeth. Tooth loss is not something that happens simply because we grow older. It's indicative of oral degeneration. Teeth become diseased; gum tissue becomes infected and inflamed. Sometimes, poor oral health leads to a breakdown in the connective and bone tissues far beneath the surface, which degrades the stability of teeth. One of our primary messages to our patients is that tooth loss is preventable with regular oral care. Don't let dental problems progress. Call your Pasadena dentist, Dr. Vasag Bouzoghlanian, for treatment that can save your smile. What wappens when oral disease goes too far? 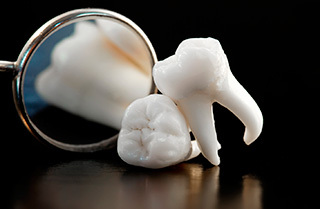 Tooth loss may not always stem from a dental problem. We have performed tooth replacement for numerous patients who experienced an unexpected injury that cost them a tooth. Regardless of the underlying cause, we move forward with treatment with the intent of restoring natural aesthetics, feel and function. Your replacement teeth should look and feel as close to your natural teeth as possible. The best way to achieve this is often with dental implants. Dental implants significantly improve the outcome of tooth replacement by reinstating an adequate foundation. Your natural teeth are stabilized by their roots. When we insert dental implants, we create a similar solid structure. This leads to ultimate function and comfort that enables you to eat a wide variety of foods, even those that are crunchy or chewy. Implants are also advantageous because they support bone regeneration by transferring force from chewing into the jawbone. While many people look for a Pasadena dentist who can perform dental implant treatment, conventional options are also available in our office. We recognize that there are situations in which a fixed bridge or a denture may be the most appropriate choice for tooth replacement, and we remain committed to achieving lasting results for each patient using whatever method of care best suits their needs. We care about our patients' smiles, and it shows in the results we achieve. To learn more about your options for tooth replacement, call Prestige Dental at (626) 577-2017.